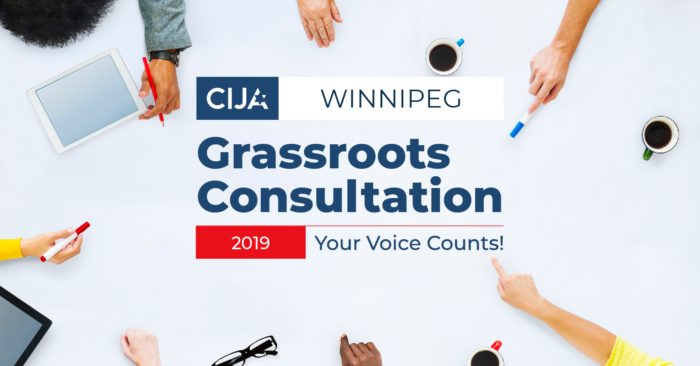 CIJA is excited to announce our 2019 Grassroots Consultation taking place Winnipeg on February 7th from 5:30 - 7:30 pm at Congregation Shaarey Zedek in the Upper Lounge. This is a vital opportunity to ask us anything, tell us what’s on your mind, and help shape our advocacy priorities for the year ahead. In addition to group conversations and an “open mic” session, this year’s Consultation will include an update on CIJA’s strategic efforts to fight antisemitism – which, in recent years, community members have consistently reported to be their top priority. From combating antisemitism and strengthening Jewish community security, to advocating for human rights and building support for Israelis, everything we accomplish is because of you. Be part of our work. Make your voice heard. Space is limited. Click here to register and secure your spot at CIJA’s Grassroots Consultation.